You may have noticed that Grace did not join us for the new release this month. Sadly Grace has stepped down from the team. Grace and her husband, who recently retired are relocating from South Carolina to Tennessee to live closer to her daughter, son-in-law and 2 teenage grandchildren. Once settled, Grace will be helping with her daughters gardening business. We are missing Grace so much here at ODBD. Grace first came on as a Guest Designer in May 2009, then joined us as a Design Team member. She soon took over the role of Design Team coordinator for several years, then remained active each month as an Alumni Team member. In 2015 Grace was diagnosed with Breast Cancer (see post HERE). Throughout her course of treatments Grace always kept such a positive attitude. Her tremendous faith in God is what helped her get through it at that time and what continues to help her in the post treatment medical problems she has now. With the knowledge of personally going through chemo, Grace learned what types of bible verses helped her the most and she knew the kinds of sentiments and verses she liked to hear. She thought others could be helped as well with these ideas. Instead of simply saying "Get Well" (which sadly we know may never happen) the sets Grace contributed have verses that contain comforting quotes and sentiments suitable for such recipients. I am sure you will enjoy reading that post. Grace has promised us that if and when things settle down for her, and she is able to get back to card making, that she will be sure to come visit and craft with us at ODBD. Until then I can only say "thank you so much" to Grace, for all she has done to help promote God's word through Our Daily Bread Designs. Grace is such a special person, and will be missed by so many! 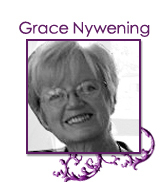 I had the pleasure of working with Grace for a couple of years on the Stampin' Sisters in Christ blog, and she was amazing. Glass half full...all the time! Grace, good luck to you! Enjoy your family, and have fun playing with beautiful plants and flowers! Thank you so much! I have a special place in my heart for ODBD and always will! There comes a time in life for all of us when we need to rearrange our priorities and that time has come for us as we relocate to the beautiful mountains of TN. We are beginning to get settled in, but still have big projects ahead of us as well, but it's been so very special to be able to more easily spend time with family! Just tonight we had dinner at Christy's house and then made our way home in about 15 minutes. She is a market gardener and we have already planted quite a bit on our acreage in hopes of helping expand the business. It has been good to have my husband at home and we hope we can have many more years together to enjoy time with each other. Life is short and we work so hard sometimes we forget to stop and just enjoy the life God has given us. We are hoping to settle in to a new home church soon and see how God might use us there. So yes... lots of changes but we feel this was God's leading at this time. 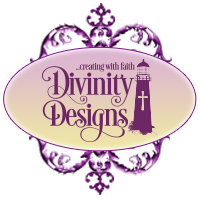 I can't thank you enough Kelley for the opportunities you have given me and for starting this business in the first place, to serve a huge need of faith based stamps for card makers who love to share the Word on their cards! May God continue to bless you and guide you!!! Grace, so sad to hear you have decided to leave the design team for now, but I do wish you well on the new adventures you have coming your way, it will be nice to be close to the kids and grandkids! God's blessings, good health and much happiness in the years to come!